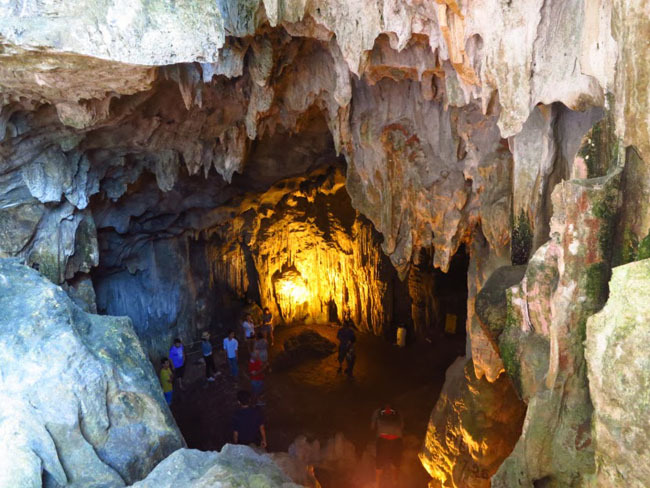 Trinh Nu Cave, along with other caves in the same cave system such as Sung Sot Cave, Dong Tien Lake, Luon Cave, is located on Bo Hon Island, which is about 15 kilometers from Bai Chay of Halong Bay. In the past, the French came here and called this cave as La Vierge (Virgin Cave). On the other hand, this cave is called “Trinh Nu Cave” by the Vietnamese. For the fishermen, Trinh Nu Cave is always their cozy home but for the lovers, this cave is even a symbol of their love. On entering this cave, you can easily see a stone statue of a girl lying in the center of the cave. The girl statue is very lively with long hair and the hoping, miserable look in her eyes. Opposite of Trinh Nu Cave is Trong Cave (or Male Cave). Inside Trong Cave is a stone statue of a man looking at the girl statue. You can even feel the despairing scream of the man and the sound of his knocking the stone wall for endless times. Sung Sot Cave is one of the most beautiful caves of Halong Bay. This cave is located on Bo Hon Island, which is in the center of Halong Bay. 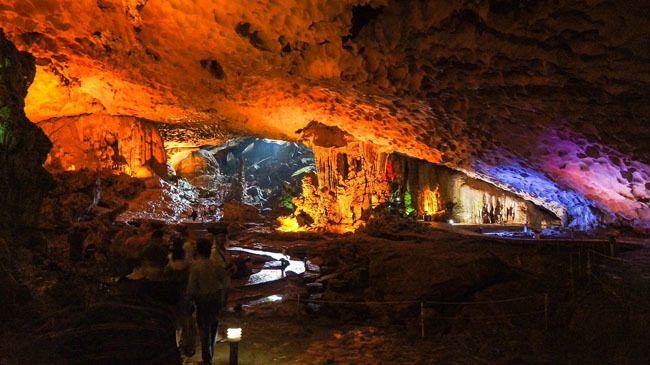 Every year, Sung Sot Cave attracts a great number of visitors, who come here to contemplate its spectacular and magnificent beauty. Before entering the cave, you must pass the long stone staircases to pass the luxuriant forests. Tourists will have an interesting opportunity of climbing the mountain. The total area of Sung Sot Cave is 10 000 kilometer square. Inside the cave is a wide range of stalagmites and stalactites in mysterious and weird shapes. 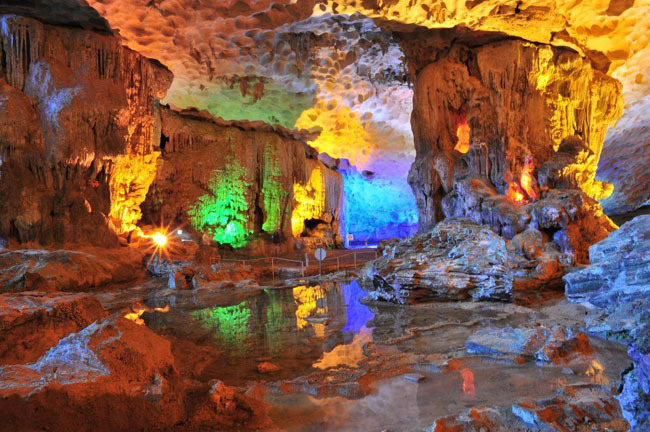 You may be overwhelmed when contemplating the pristine beauty of this fairy-tale-cave. The French used to call this cave as “Grotte Des Surprises” (The cave of surprises) thanks to its unique feature. When visiting caves in Halong Bay, you should not forget to explore and contemplate the marvelous beauty of this cave. 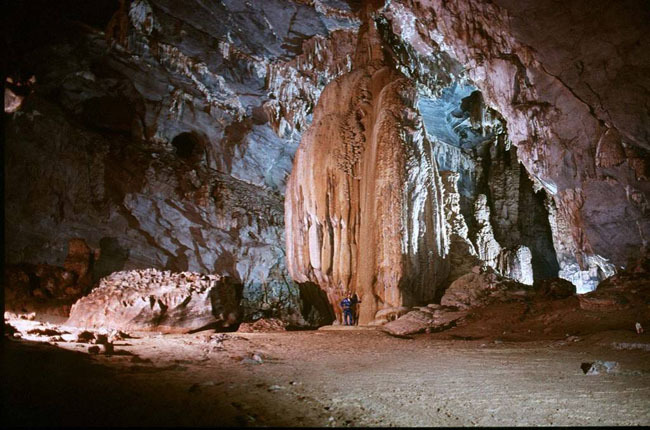 The most our tours have visited Sung Sot cave like this tour. From the far away, you can see the blue entrance of Dau Go Cave, which looks like the blue jellyfish in the center of Halong Bay. You must pass 90 stone staircases to enter the cave entrance. On standing at Dau Go Cave’s entrance, you will feel as if standing in front of a magnificent and luxurious castle with marvelous architecture. 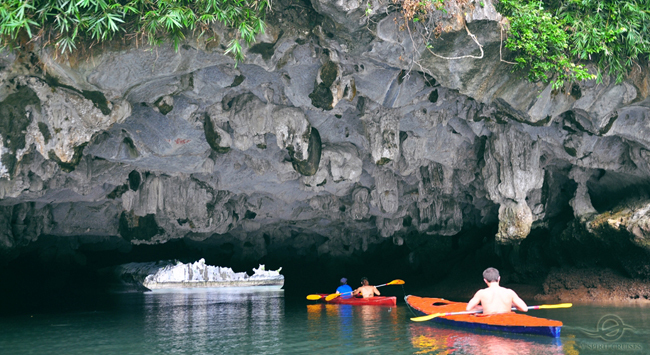 Luon Cave is located on Bo Hon Island, which is about 14 kilometers to the South of Bai Chay. The location of this cave is a steep rock with quiet crystalized water. The total length of Luon Cave is about 60 meters, and the cave’s ceiling is between 2.5 meters and 4 meters, depending on the water level. On entering the cave, if the level of water is high, you must lower your head to pass it. This must be the reason why the cave is called “Luon” in Vietnamese. The cave’s ceiling has so many beautiful and magnificent stalactites that you will surprise and amaze by the talent of Mother Nature. After passing the entrance, you will see a large lake surrounded by luxuriant forest and spectacular mountains. 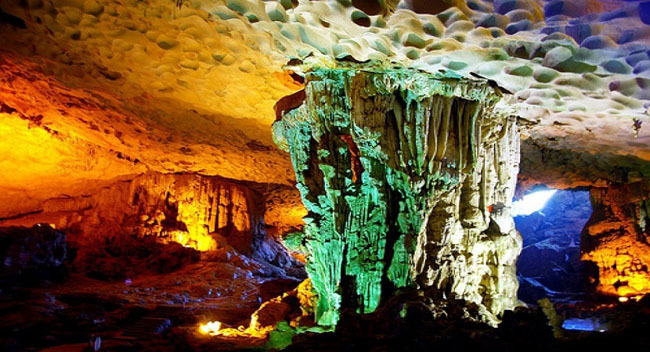 It can be said that the beauty of Luon Cave is such a masterpiece of nature. 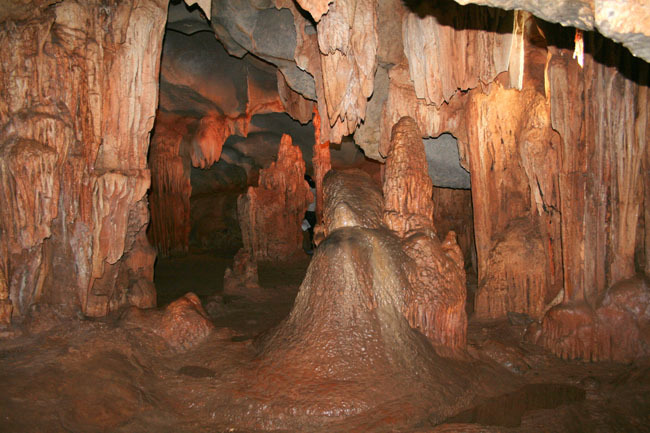 The cave is divided into 3 rooms with a lot of beautiful stalactites and stalagmites. The cave’s ceiling has many stalactites, which look like a white orchid cacti’s bud. Especially, the 2nd room of the cave is a lively natural museum with many stone sculptures of the lion, the seal, the water deities, etc. There is a long stream inside the cave, too. The cave’s wall looks like a magnificent stalactites curtain. And at the last room, tourists will have the opportunity to contemplate the spectacular and skillful sculptured artworks of the Mother Nature. Thien Cung Cave is located at the North of Dau Go Island, which is about 4 kilometers to the South of the port. This cave is about 10 000 meters square in width. Being one of the most beautiful caves of Halong Bay, Thien Cung Cave has such a complex structure with many rooms and wide, large ceiling. Especially, inside the cave is a great number of stalactites and stalagmites in weird shapes.